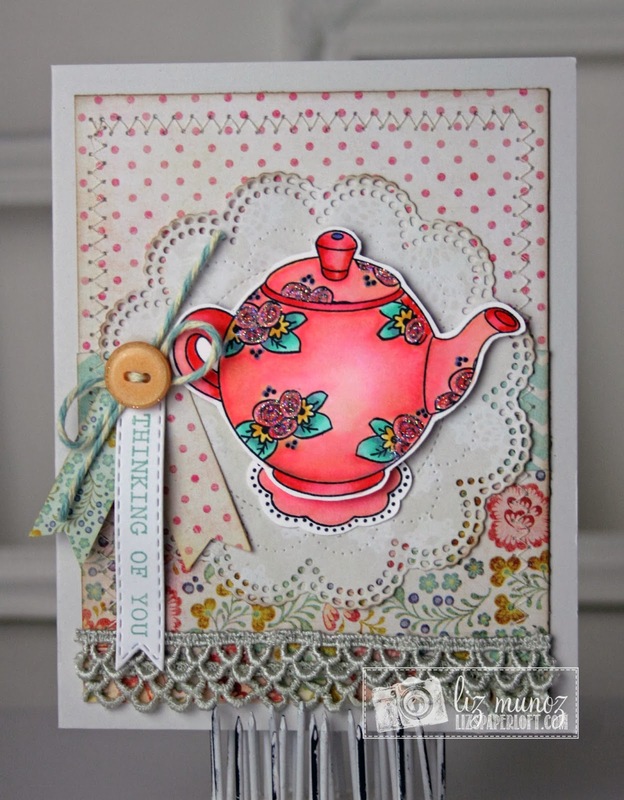 Liz's Paper Loft: Tea Pot ~ Thinking Of You! Tea Pot ~ Thinking Of You! Hi paper peeps, happy Wednesday! Hope you're having a blessed week! I've got nothing special going on today, just a card that I made for a friend that was recently in a car accident. I'm still having a blast with my copics, I really need to take a real class to learn how to use them properly. The one thing I learned recently is, it's so important to use the correct paper. It makes blending soooooo easy. I got mine at Peachy Keen. I stamp my image on it, then cut it out leaving a white border. After the ink dries a bit, then I color it. This paper is only used for copics, not for anything else...you can call me a hoarder! I wear the name proudly! lol! It's hard to see but I added a small amount of fine glitter to the roses on the teapot. This is gorgeous Liz!! Your friend will love this!!! 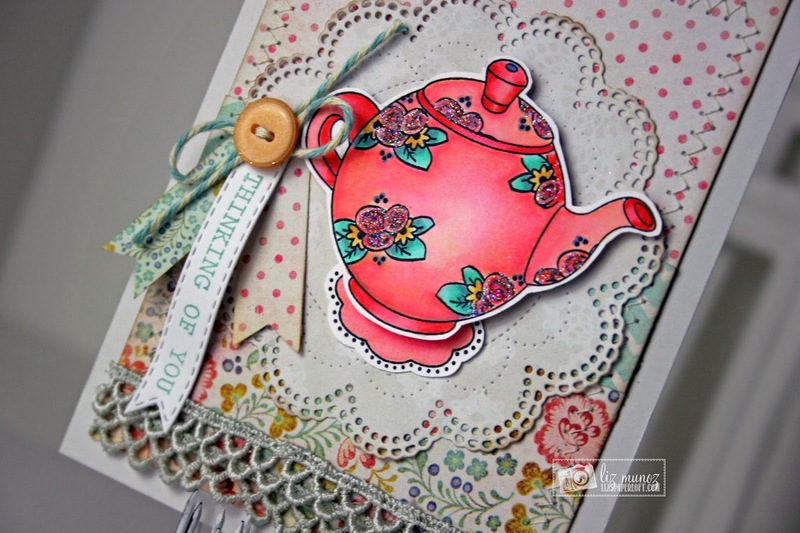 AWESOME coloring and love the flowers on the tea pot!! Stunning Card and Amazing Coloring. What a beautiful card and so thoughtful of you, she will love it!! Hugs!! Liz ~ BEAUTIFUL card! 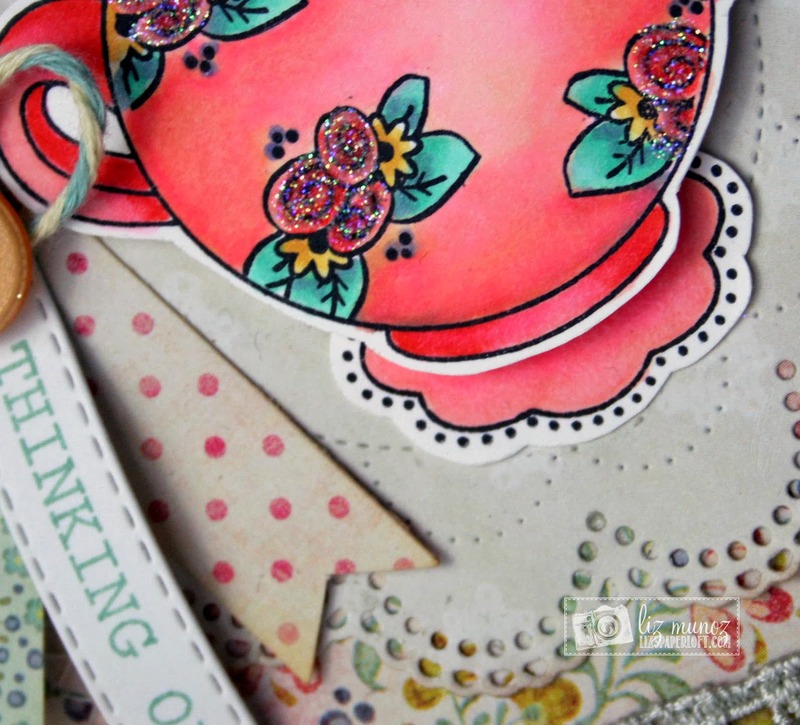 LOVE all the details, the stamps, papers and of course the coloring!!! You are making me want to try harder with my Copics! MCT February Release Blog Hop ~ Bravo! MCT February Release Sneak Peek Day 3 ~ Chick! Trendspotting ~ It's Time To Get Better! MCT ~ Sneak Peek Day 2 ~ Happy Spring! PKS Color Challenge 14-02 ~ Life's A Beach! MCT Made In Minutes ~ It's Your Day! MCT Tag It Tuesday ~ Thinking About You!